Alternative Anti Aging Skin Treatment Stimulates Collagen Production. Alternative anti aging skin treatment stimulates collagen production to reduce wrinkles, nourish, hydrate & clear skin. 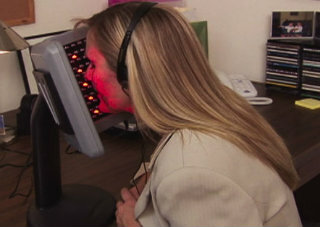 Photo Facial LED DPL® Therapy helps renew skin to a younger complexion. Using alternative anti aging light treatments for healthy skin rejuvenation, wrinkle reduction and stimulating collagen production and elastin couldn’t be easier, more natural or cost effective than photo facial LED panels for home use. Proven effective and safe the DPL® Therapy System utilizes Red and Infrared light and a proprietary design based on NASA and medical research to treat aging, photo-damaged skin. Portable Skin Renewal System Plumps and Firms Skin Reducing Wrinkles and Smoothing Skin. Collagen and Elastin are essential proteins that keep skin plump, smooth, firm and tight which in turn reduces wrinkles giving smooth skin and a younger looking complexion. Red and infrared wavelengths penetrate deep into the dermal layers of skin and tissue to help rebuild and plump thinning skin. Producing the required level of energy to stimulate fibroblasts which cause a boost in collagen production and elastin repair; helping restore skin to its more supple and youthful state. 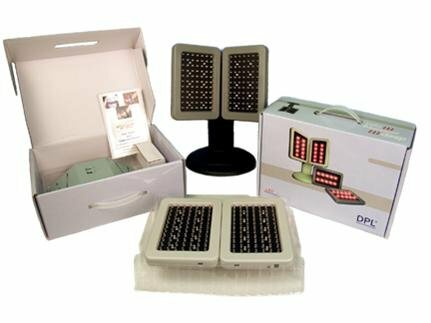 DPL® photo facial LED panels rejuvenating deep penetrating light therapy system from LED Technologies is safe, non toxic and non invasive yet, it is very effective in reducing wrinkles and diminishing the effects of aging, smoking and photo damage of the skin. Light-emitting diode or LED - photo facials are a good choice for people who want to boost collagen production and/or treat acne. The results won’t be as dramatic as plastic surgery, but a gentle, more natural and less expensive way to younger looking skin, without any downtime. 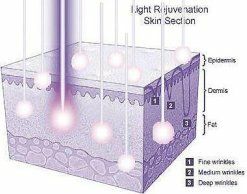 For most women and men the biggest skin aging concern is minimizing wrinkles, fine lines and overall saggy skin, light therapy not only helps with these signs of aging but many other too. Using photo facial LED panels as an alternative anti aging skin treatment delivers optimal results for overall skin health and reversing and controlling the signs of aging. DPL® Therapy uses medically tested rejuvenating wavelengths of 880nm Infrared and 660nm Red photo facial LED panels to stimulate collagen production. Collagen is the most common protein found in the body and is the essential protein used to repair damaged tissue and to replace old tissue. It is the substance that holds cells together and has a high degree of elasticity. Not only does the home use deep penetrating light help increase collagen production it also stimulates, repairs and helps produces Elastin. Elastin is a protein similar to collagen. It is the chief component and the major connective protein tissue of elastic fibers. Photo facial LED treatments also stimulate fibroblast activity, which aids in the repair process. Fibroblasts are present in connective tissue and are capable of forming collagen fibers. And it also, stimulates the release of adenosine triphosphate (ATP). ATP is the major carrier of energy to all cells. Loss of collagen makes way for thin skin, fine lines and wrinkles that make us look older, but we can reverse the signs of aging skin simply by stimulating collagen production and helping elastin repair itself. Nourishing the dermal layers of your skin with DPL® Therapy replenishes and rebuilds your skin for that smooth feel and younger looking complexion. Thanks to natural resources and technology, there is now inexpensive, alternative anti aging skin treatments that can give you a non-surgical face lift by the use of photo facial LED’s that are FDA approved for home use. After using DPL® Therapy LED panels for a few weeks, you will begin to see the wrinkles reduce as your skin becomes plump, clear and smooth again. If you suffer with Rosacea, brown spots or other skin conditions it helps clear them up too! After the first session, your skin will begin to transform and continue to improve with each use. So, if you're bothered by wrinkles, loss of skin elasticity, age spots and even acne or other signs of aging skin, there are alternative anti aging skin treatments that are effective and inexpensive for your facial rejuvenation needs. No Coupon or Promotional Code Needed..!! We are very excited to announce and proud to share the proven and effective benefits of the Deep Penetrating Light at a discount, for just $299.99. That's a savings of $50.00 off the list price. The DPL® Therapy System list price starts at $349.99 at most retail store locations and online sites. BHW Enterprises, LLC is an authorized distributor of LED Technologies DPL® Therapy System and for a limited we are offering this amazing deal.. Coupon or promotional code for this great offer on the DPL® Therapy System is not required. get your dual Alternative Anti Aging System today! Click here to read the FAQ's about this powerful and natural Alternative Anti Aging Skin Treatment. Order your DPL® Therapy System now and start rebuilding your collagen and elastin for a wrinkle free, smooth, re-hydrated and younger complexion! Note: DPL® Therapy panels are a dual efficient system, providing an alternative anti aging skin treatment and alternative arthritis treatment too! DPL FAQ's - Frequently Asked Questions and Answers.